"Star Wars Episode 1: The Phantom Menace" started the prequel trilogy that either you adamantly loved or adamantly scorned. It was one film that filled with controversy not only because of one "character choice" but also the over-hype that people built around it that probably led to the huge negativity towards the film. Thirteen years after that fateful release, George Lucas has decided to convert all Star Wars films into the 3D format. This is the first salvo of a hextuple release - a salvo that may define how people perceive Lucas' latest decision. The biggest question of course is, "Does 3D add more depth to Episode 1?" The answer sadly is no. The Galactic Republic is in a period of decline. In response to a taxation on trade routes, the Trade Federation organizes a blockade of battleships around the planet of Naboo. The Supreme Chancellor dispatches two Jedi, Qui-Gon Jinn (Liam Neeson) and his apprentice Obi-Wan Kenobi (Ewan McGregor) to negotiate with the Trade Federation Viceroy. However, Darth Sidious, who is in control of the Viceroy, orders the army to kill both Jedi and invade Naboo. The two Jedi are able to escape to Naboo and save Queen Amidala (Natalie Portman) from capture. The group escapes Naboo using the Queen's personal starship but is damaged on its way through the forcing them to land in Tatooine, a nearby desert planet free from Trade Federation control. There Qui-Gon meets a slave named Anakin Skywalker (Jake Lloyd). Qui-Gon senses an unusually strong presence of the Force within the boy and suspects he may be the "Chosen One" of Jedi prophecy. Qui-Gon makes a bet with Anakin's owner to enter him in a podracing tournament - if Anakin wins, he will be freed. Anakin manages to win the race and joins the group to be trained as a Jedi but he is forced to leave his mother behind. The biggest dilemma for us going into "Star Wars Episode 1: The Phantom Menace 3D" is determining if the 3D conversion and re-release is necessary. On one hand, 3D adds depth on some but mostly none. Let us explain further. If you think 3D will make "Episode 1" a better film then you will leave disappointed as it obviously won't. If there are changes, those were so subtle that we didn't even notice and more or less composed of special effects that will complement the 3D format. This is a good thing actually as we do think that sticking close to the original film as much as possible should be the decision Lucas has to take. What the 3D conversion does though is make some scenes way cooler, more fun and more exhilarating. Scenes such as the pod-racing sequence in Naboo or even the ménage à trois battle of Darth Maul, Obi-Wan and Qui-Gon are some examples that fully-utilize and look and feel awesome in 3D. Mostly though, these are just limited to action scenes and unfortunately, "Episode 1" is mostly composed of dialogue between characters. This is a long movie that will test your eyes' capacity to watch and induce 3D. 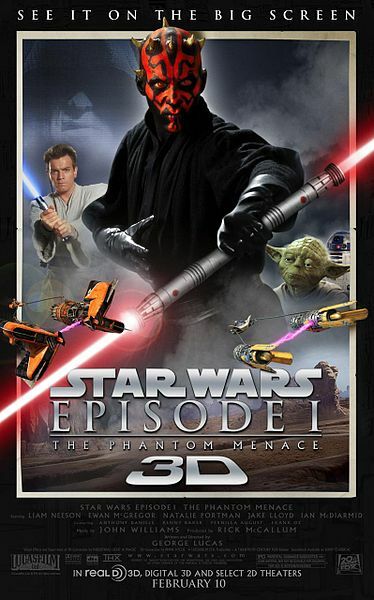 In the end, "Star Wars Episode 1: The Phantom Menace 3D" fails to leave an impression on us. Yes, this is the format to go if you need to re-live "Episode 1" once more or if this is your first time to watch the film but this first foray also fails to justify the 3D conversion and that bothers us most.